Rabbits love to chew and our natural apple sticks are ideal for them to gnaw as they’ll adore the taste and additionally, chewing wood helps prevent their teeth from growing too long. 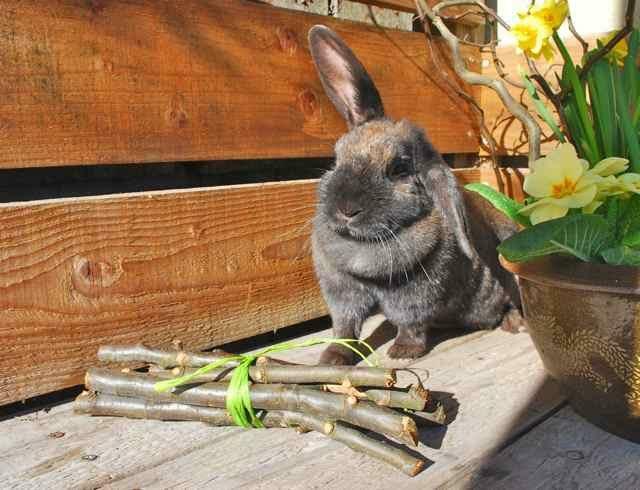 They’ll love to chew the bark off each stick and nibble the wood (apple wood, like willow, is safe for rabbits to chew). Chewing apple sticks also keeps them entertained and prevents boredom. Offer your pet one or two sticks depending on the size of the stick. 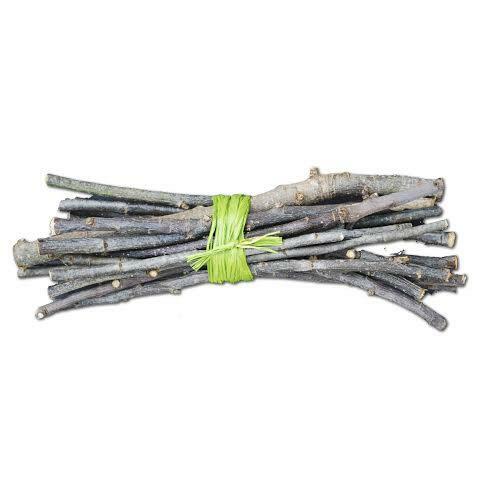 These natural rabbit sticks are also suitable as guinea-pig chews, chinchilla chews or degu chews. Our apple sticks are from gathered from the farms of family and friends in Somerset. We cut the sticks from discarded branches obtained by pruning the trees in the Spring. After cutting the sticks into lengths, we soak them in water and scrub them thoroughly to make sure they’re pristine for your pet. 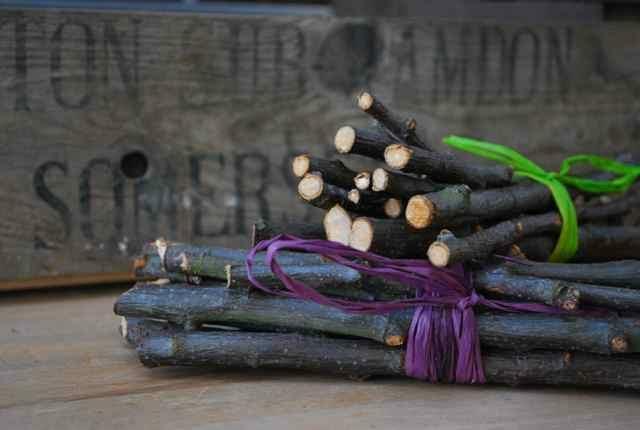 We then allow them to dry before packing them in 200g bundles of assorted sized sticks, hand tied with raffia. 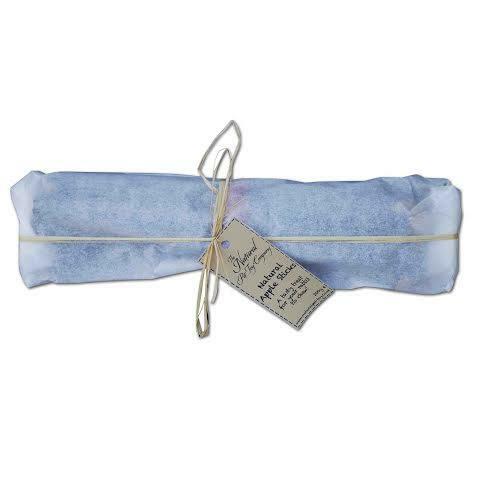 We do take care to ensure that there are not sharp ends on the sticks but as these are a natural product, they are somewhat rustic in appearance and by their nature, will always vary in size and shape. Please take care with children and sticks! This a great idea, makes a perfect gift for the animal lover who has everything - the rabbit enjoyed it too! Nice bundle of sticks for a friends' rabbits - were enjoyed! Ordered these for my chinchilla as the site I usually use was out of stock. Fast delivery, beautiful packaging, and my chinchilla loves the sticks! Will definitely place orders here in the future. Our bunnies love your Apple Sticks! Great products, quick delivery times and excellent customer services. Will definitely be ordering again, and I'm also keen to try out some of the catnip toys for my cat, Milly! Arrived very quickly. Received about 15 sticks in each pack. Very happy degu's. I could not find these apple tree twigs anywhere else. I received 15 twigs, on average 8" long, and 3/8th thick. My house rabbit gets nothing but hay and green leaves to eat, which he spends hours each day eating. So does not need these to wear his teeth down. Unlike other rabbits that are not fed enough hay. However, every time he comes in through the cat flap from the balcony I hear a rattling on plastic floor of his cage. And he is having a bite at one. A rabbit not eating enough hay, because its owner gives it pellet food, Should need these twigs to keep it's teeth worn down. Thank you TNPTC for these twigs. I had heard great things about apple sticks from other rabbit owners, who said their rabbits preffered these over willow sticks by tenfold. Sure enough when I got this batch of apple sticks in the mail the bunnies went crazy! Particularly our head bun, who likes to parade these sticks around in her mouth until she finds the perfect spot to chew them. They can nibble through each stick in less than 20 minutes!! Excellent service, highly recommend, would use again,rabbits pleased as well. Thank you very much. I found this site as I was searching for apple sticks. I received the package promptly, beautifully presented (I didn't want to undo the ties on the sticks they looked so nice!) and a hit with my bunnies. I would definitely use this company again and recommend it to my friends and family. Bertie my chinchilla loves the apple sticks. And thank you to Debbie for quickly resolving a problem and the speed of delivery of my second order. Beautifully presented bundles of apple sticks, went down a treat with 2 out of 3 bunnies (but the third is notoriously fussy)! Very quick delivery and my delivery instructions had been clearly written on the package so I didn't have to make a trip to collect it. Will definitely order again. We bought these apple sticks for our pet degus. They were delivered fas,t well wrapped and the sticks were clean. Beano my chinchilla absolutely adores these apple sticks. This is my second order with The Natural Pet Toy Company, brilliant friendly service and great products.